Date Night? (104/365 year 3) – Annoyingly Boring? There are multiple things that worry me here. 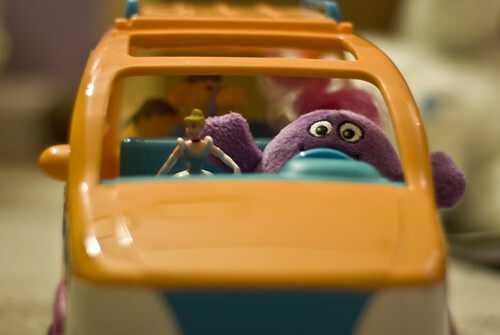 I am not sure that Grimace even has his driver’s license. I don’t think Cinderella’s Fairy Godmother would approve of her choice of date. Why is there a camel in the back seat? And I KNOW that Dora’s mom did not say that Grimace could borrow the minivan. LOL! Do you think Prince Charming knows about this? I agree with Laura, your commentary made me laugh. Nice job on the photo and caption. Pat – another great shot and commentary. You are hilarious. Nice perspective and DOF here, Pat.